This entry was posted in 未分類 and tagged SAKANAMON, モーモールルギャバン. Bookmark the permalink. 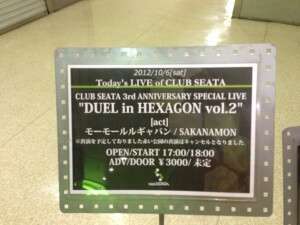 One Response to "CLUB SEATA 3rd ANNIVERSARY SPECIAL LIVE “DUEL in HEXAGON vol.2″"